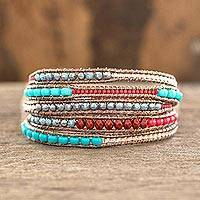 I love this bracelet because it looks awesome alone, or when I am going out, in combination with other silver or turquoise bracelets. 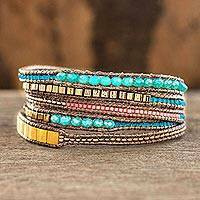 It's a combination of turquoise, brown, gold, and even some pink. 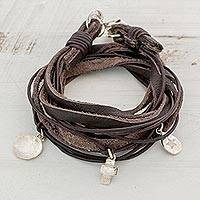 This makes it compatible to combine with many natural stones. Have not taken it off since I received it. 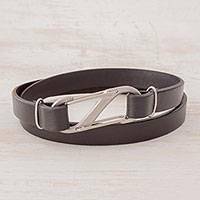 I decided I wanted more of a biker look with a touch of real class and this is the item that carries both off. It is so interesting when you first put it on you can't take your eyes off of it. Each section so skillfully made and if taken care of properly will be a lifelong favorite. My room mate fell in love with it (my man friend) so I bought him one and made an extension so that he could have his own. "These Maya designs date back more than 1,200 years. So when a woman weaves today, she is continuing the path toward her ancestors and confirming the validity of their teachings in her work." "I'm a fighter, perseverant and willing to overcome any obstacle that keeps me from achieving my objectives. My family fills my life. I have a son born in 2002, a daughter born in 1994 and my first son, born in 1990. They still occupy a great part of my time and my husband's. I enjoy the moments we're together. The difference in their ages lets me experience different stages of life, each one filled with surprises. "I was born in the capital but I lived for nine years with my parents in the picturesque village of Amatitlán. My mother is Guatemalan and my father of Italian ancestry. My father tells how my grandparents were Italian artisans who crafted very elegant felt hats. When they arrived in Guatemala, they set up a workshop here. My mother worked as a nurse but her art is crocheting. I remember that everything her hands created was a total success – she has exquisite taste for combining colors and even today she brings a very special touch to decorating the home. "My childhood was lovely – I'd call it a fairy tale. My parents, like all dreamers, had achieved what they called 'The American Dream.' In 1974, when I was nine years old, we moved to Chicago to live. That's when my fantasy world quickly took a 180-degree turn as I realized I had become a very independent adolescent, sure of myself and emotionally strong. I had conquered my fear of not fitting into a world totally different from that of my village. 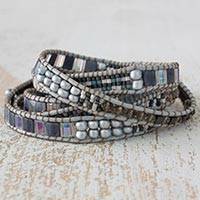 "I've always felt a passion for fashion and accessories. I remember during my first years at college, I'd spend vacations in Guatemala to create a collection of modern casual clothing based on our beautiful handwoven jaspe fabric. The collection was a success and opened doors to opportunities in the North American market. I worked at it for the entire season, then stopped while I finished my university studies. 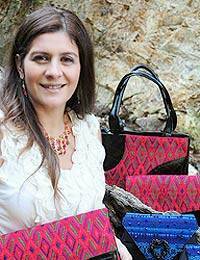 "Today I've taken up this art once more, designing and selecting different materials, but always using the beautiful handloomed brocades woven by Maya women to decorate my handbags. Each one of my collections has its own charm, due to the designs and to the meaning of the Maya symbols in the embroidery. "I'm convinced that we all possess the innate gift of art, but not everyone has the time to discover it. I've spent the past year researching the components of my materials to be sure they are lead free. I've also devoted hours to designs inspired by the most important Maya elements, using the same techniques as the women. 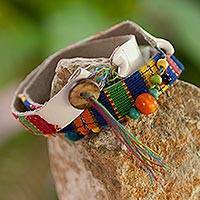 "My handbags are crafted of leather with inserts of handwoven fabric from the huipil blouses worn by Maya women. They feature symbols related to the sun, the moon, the celestial bird, the serpent, the earth, fertility and foliage, authority and duality. This is a reflection of their world view. "These Maya designs date back more than 1,200 years. So when a woman weaves today, she is continuing the path toward her ancestors and confirming the validity of their teachings in her work. "As a designer, my main work is to make the world aware of the richness of Maya culture. Guatemala is the cradle of this unique civilization. When you choose my handbags, you are acquiring a piece of history because the Maya weaver combines creativity and tradition in every textile. This is why these handbags are unique. You are also fostering the continued use of the backstrap loom so that this art will be taught to future generations and not be lost." 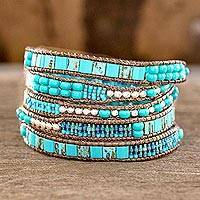 Soothing Teal Wrap Bracelet Crafted by Artisan Group, "Soothing Teal"
The contrast between blue and turquoise with pewter beads inspires soothing elegance. 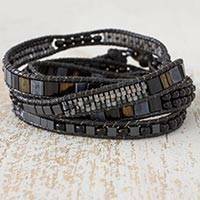 Women artisans from Guatemala's Weaving Hands of Atitlán craft the wrap bracelet by hand with dark brown cords.